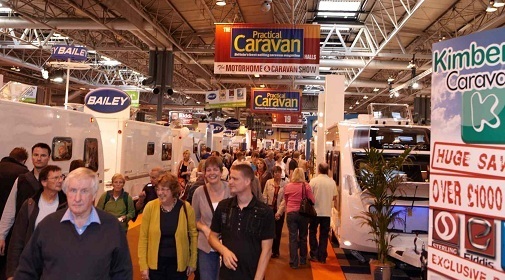 The caravan and motorhome industry’s national showcase, The Motorhome & Caravan Show, returns to the NEC in Birmingham this autumn (16th – 21st October) bigger and better than ever, one whole hall bigger! We had 10 pairs of tickets to give away for this year’s 2013 Show. The Motorhome & Caravan Show is the only place to see all the brand new 2013 models of caravans, motorhomes, holiday homes, lodges, and accessories from the leading UK and European manufacturers and dealers hot off the production line. With experts on hand to offer free motorhome and caravan manoeuvring lessons and information and advice on a wide range of subjects, from, technical issues, security, insurance and finance to how to tow safely both in the UK and abroad. TV favourites Master baker, Paul Hollywood and ex-England scrum-half–turned-culinary-genius, Matt Dawson MBE, will be making special guest appearances at the National Show. See Paul live in the show’s Cookery Theatre on Wednesday 17th October or see Matt on Saturday 20th October, where they promise to entertain visitors with live demonstrations full of inspiring ideas and advice for creating delicious meals in minutes. With a range of free activities, from indoor archery to petanque (French Boules) there is something to keep the whole family entertained. If you are not one of our lucky winners don’t worry, advance tickets start at £7.00 for seniors (60 + years) and £8.00 for adults. Children under 16 years are admitted free of charge when accompanied by an adult. Advance tickets must be purchased before 15th October 2012, and are subject to a £1 transaction fee. On-the-door tickets are priced at £9 for seniors (60+) and £10 for adults.